Abundant red blooms with a touch of lavender and brown blotches against a back ground of dark green broad leaves. Excellent used as a foundation plant, accent, natural setting and mass planting. We offer Nova Zembla 18" to 24" in a 5 gallon container. Fertilize in the spring after blooming with a food for acid-loving plants. 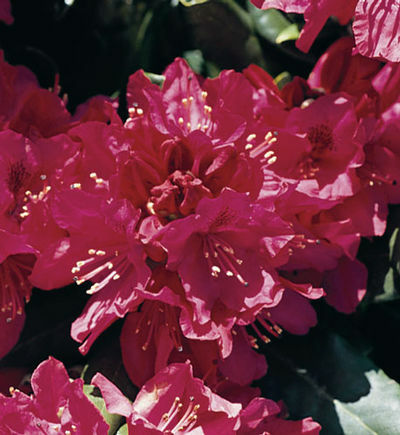 Voted the #1 shrub among many gardeners for its large dense green foliage and abundance of beautiful bell shaped flower clusters in the spring. The trusses are 5” to 6” in diameter. The dorsal petal of each flower is speckled with green, yellow, cinnamon-red or brown. This acid-loving plant has a shallow root system. Plant in rich organic, well-drained soil and mulch to protect the root system. This handsome broadleaf evergreen does well in sun or light shade and can grow from 6’ to 10’ tall with equal spread. Beautiful used in a natural setting, single specimen or mass planting, excellent choice for a blooming hedge.